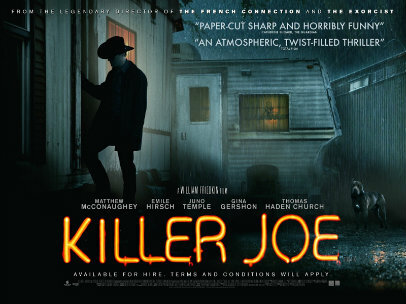 Entertainment One have released the official U.K. poster for crime-thriller Killer Joe, Empire has unveiled. Directed by world-renowned and controversial filmmaker William Friedkin, Killer Joe centers on a young man whose life spirals out of control when he hires an unexpectedly charming hit man to kill his own mother for her life insurance policy. 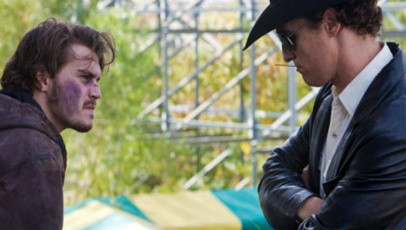 Starring Matthew McConaughey, Emile Hirsch, Juno Temple, Thomas Haden Church and Gina Gershon, Killer Joe is set to open the 66th Edinburgh International Film Festival on June 20 before hitting cinemas across the U.K. on June 29. Killer Joe comes from the man behind such films as The Exorcist and Rules Of Engagement and, with its promising cast and killer narrative, promises to be one of this year’s most violent, debatable releases. Previous Post Cosmopolis Poised For June 15 Release In The U.K.